This document applies to Cognadev’s Online Systems, including our public website, Skylab, the Online CPP, LOI, VO, MP, CCM and Cliquidity assessments. Cognadev’s legacy programs that were installed on users’ computers, such as the Offline CPP, should not be used as they may breach local data protection requirements. Please read the notice carefully to understand our views and practices regarding your personal information. Personal information includes information relating to an identifiable natural person including biographical information, contact details, views, location, preferences, beliefs and orientations. We will take all reasonable steps to prevent unauthorised access to, or disclosure of any personal information without explicit consent of the data subject or parties involved. If you do not agree with any aspect of this Privacy Notice, you have the right not to continue to use the website, portal and/or the services of Cognadev. 2. What types of personal information does Cognadev collect? 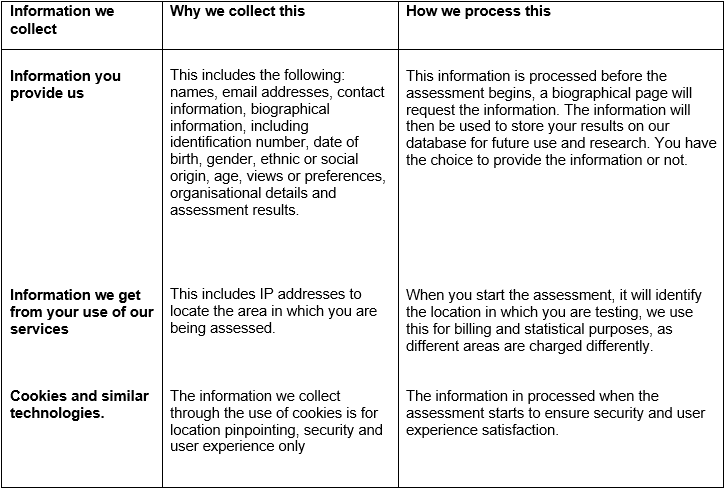 By continuing to use the Cognadev website, portal or services, users agree that we may collect, collate, process, store and / or retrieve your personal information (“Collect”) for, amongst other things, for the purposes of (i) delivering our services and products, (ii) doing research and development; and (iii) for later authorised requests for assessment results. The above-mentioned information collected is used to comply with our contractual agreements and legitimate interests with candidates, companies and consultants. We also collect the information for statistical and research purposes. We use the information we collect from all of our assessments for billing, as well as anonymous statistical and research purposes. The collection of your location is solely used for billing purposes. The information collected from candidates is not used for marketing purposes. People have different privacy concerns. Our goal is to be clear about what information we collect, so that you can make meaningful choices regarding the information you are prepared to provide us with. 4. How can you update your personal information? You can update your account details on the Cognadev delivery platform by contacting your assessment consultant or account manager. Should you be a Distributor of the Cognadev assessment products, and appoint sub-distributors, agents or administrators, it is your responsibility to update their information on your account and to ensure confidentiality of all personal data. You will also have access to their activities on your account. Your Cognadev account can only be accessed via your personal password. It is your responsibility to keep your password confidential. This applies to all users of our delivery platform, Skylab. If you change your email address, and inform us, we will verify the new email address. Until the new email address has been verified, the old email address will remain in force and effect. All personal data and assessment results will be stored by us for purposes of anonymous research and support of HR functions. 5. When will Cognadev collect information about you? 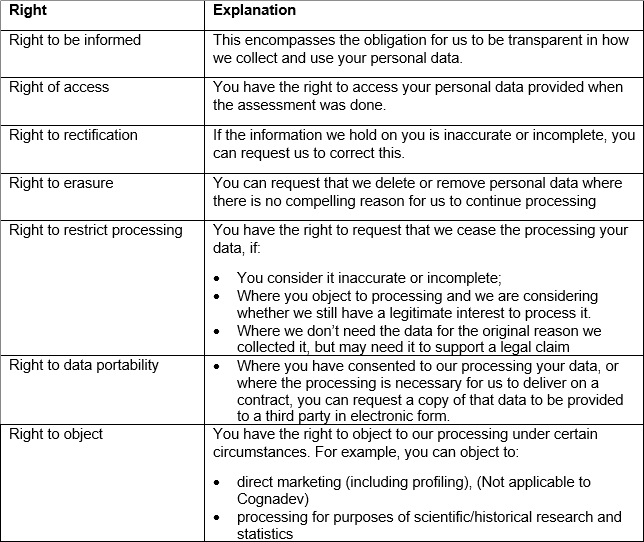 Your explicit consent has been given: We will share personal information with companies, organisations and consultants when we received a data release form signed by yourself giving consent to release your report to the consultant, company or organisation. Data transfers abroad: Personal information transferred abroad is processed for statistical and research purposes by our researchers. This information is completely anonymised. We have contractual agreements with our researchers. Personal information used for statistics or research is anonymised before it is used. Skylab Consultant is only accessible to Cognadev staff, consultants and administrators. All passwords are encrypted and not accessible to Cognadev. Candidate information is only accessible to Cognadev staff, consultants and administrators. Cognadev does not have access to consultant or administrator’s Skylab passwords. Passwords can only be reset via the “forgot password” link. Cognadev has no access to passwords. Our data is encrypted in transit, at rest and when backed up. Our data is stored in Microsoft Azure – North Europe and West Europe. Regular backups are created and maintained. Data used for statistics and research is anonymised before it is used for the specific purpose. The personal data of clients and assessment candidates, including biographical and organisation specific information, is captured via the completion of secure online forms and non-automated means by HR practitioners, consultants, administrators and assessment candidates. The collection of personal data from other sources does not prejudice the legitimate interest of the data subject. All users of our products and services need to comply with the obligations imposed by law on the responsible party. The responsible party thus bears the burden of proof for the data subject’s consent to access to personal data. If the data subject objects to the processing of personal data, the responsible party needs to comply. The responsible party must take reasonable steps to ensure information captured is complete, accurate and not misleading. When necessary, records need to be maintained. Organisations, clients and consultants who use our products and services thus have to take the responsibility to obtain and store written permission from all assessment candidates or data subjects to access their personal information. In the case of test candidates that are under age, accredited users of our products and services need to obtain and store written consent from a responsible parent or guardian before capturing any personal data from a minor. Assessment results will be captured and submitted online to be scored automatically and stored on a cloud-based server. Unauthorised access to the server is prevented via the use of secure passwords. Online backups are completed daily and weekly. Antivirus services are built-in to the server. The assessment results and reports of candidates as generated by Cognadev can be accessed by authorised and professionally qualified and accredited HR practitioners and consultants through the use of passwords. Checks of existing assessment results of test candidates will be done by professionally accredited HR practitioners through the use of personal passwords. Users of our services and products need to ensure the confidentiality of their Cognadev passwords. Cognadev (Pty) Ltd (the Company) is a private company incorporated in accordance with the laws of South Africa, with company registration number 1994/009617/07 and whose registered office is at 18B Balmoral avenue, Hurlingham, Sandton, Johannesburg, 2196, South Africa and postal address Po Box 3429, Northcliff, 2115. Telephone: +27 11 884 0878, Electronic mail: info@cognadev.com (“we” or “us” or “our“) are committed to protecting and respecting your privacy. Cognadev UK (the Company), is a private company incorporated in accordance with the laws of England and Wales, with company registration number 5562662 and whose registered office is at 2 Jardine House, Harrovian Business Village, Bessborough Road, Harrow, Middlesex, (“we” or “us” or “our“) are committed to protecting and respecting your privacy. Where there are reasonable grounds to believe that personal information has been accessed by unauthorised parties, we will notify the involved parties as soon as is reasonably possible. 8. Will Cognadev share your personal information with third parties? We will not disclose any personal information to third parties without the permission of the data subject involved in terms of this Privacy Notice. To monitor web traffic: web servers serving the website automatically collect information about pages you visit. Cookies are pieces of information a website transfers to a user’s hard drive for record-keeping purposes. We may place cookies on your computer to store and sometimes track information about you. Please note that most browsers are initially set up to accept cookies. If you reset your browser to refuse all cookies, the website / portal will not function properly. An IP address is a number that is automatically assigned to a computer whenever it is connected to the internet. We log IP addresses, and the location of computers on the internet. We collect IP addresses for the purposes of system administration and to audit the use of the website / portal. We do not always link IP addresses to personal information, which means that your session may remain anonymous. However, we cannot guarantee that this will always be the case, as it may be necessary to identify a particular user when it is necessary to enforce compliance with the law or these terms, or to protect our website, its users or other interests. Any changes we may make to our Privacy Notice in the future will be posted on Cognadev’s website (https://www.cognadev.com). Please check this regularly to familiarise yourself with the most recent version of this Privacy Notice. We recognise that you may have questions on how we process and/or store your data or may want to change either the data we hold on you or how we communicate with you in the future. If you are unhappy that we have responded to your query adequately, of if you have a further complaint, The Information Commissioner’s Office can be contacted on +44 1625 545 700.